Yale Grounds Maintenance continually looks for ways to improve operations and this year, one such change has successfully addressed the challenges of landscape watering on Yale’s campus. Joe Signore, who supervises landscaping and grounds for the downtown area of central campus, has worked to decrease water usage, thus increasing financial savings, by implementing smarter sprinkler and irrigation systems. The technology, which was first implemented in the larger spaces at Old Campus, Cross Campus, Central Power Plant, and Crescent Lawn, uses weather-based automated technology, which is controlled using a smartphone app. The app, which is connected to local meteorology forecasts, will pause if rain is predicted, thus limiting waste by complementing what is naturally occurring. In addition to the lawns that make use of the weather-based technology, lawns in four residential colleges utilize flow-sensing smart technology in order to limit excessive water use. These systems, in Berkeley, Silliman, Stiles, and Timothy Dwight colleges, use a flow-sensing valve in the main pipe to track unusually-high water output and automatically shut off, thus alerting Signore and his team that something in the system is broken or not functioning properly. 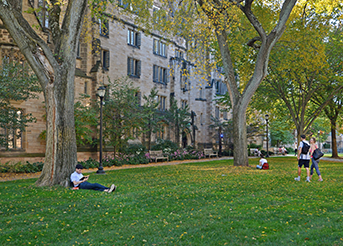 In addition to the improvements in sprinkler control, Yale has increased the frequency of lawn aeration which also helps to improve health of campus grounds that get heavy use during the academic year. When soil becomes too compacted, water from the irrigation system can’t soak into the soil as easily, decreasing drainage and nutrient flow. More frequent aeration practices make the smarter irrigation practices even more effective. Given the high usage of the lawns as gathering and recreational spaces on campus, Signore noted that it is important to ensure that their maintenance is safe, effective, and limits the impact to the environment. As these smart technology practices continue to be expanded to other parts of campus, Signore and the rest of the ground maintenance teams will continue to promote positive stewardship practices within university operations. Learn more about Yale’s sustainable stewardship efforts.